Some things in life call for approximations and some call for exact measurements. As adults, we THINK we know the difference between the two, but I’m learning more and more that we really approximate too much. My husband runs Vargo Trained, a sport-differentiated training program in his hometown. He is always talking about the “2% differentiator”. It took me a few years to really take this to heart and live giving the extra 2%... but once I did, I started to notice all the ways in which I was not striving for accuracy. 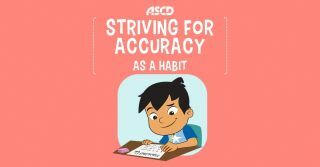 Now that I understand what striving for accuracy really means, I’m much better at communicating this important concept to students and parents as well as living it for myself. So, what is striving for accuracy? As my husband puts it, the ”2% differentiator” means putting in the extra 2% effort. In his line of work, it’s the details of creating and implementing a program: counting every rep in the weight room, running every sprint at your top speed, and meeting all of your training days. The extra 2% effort means striving for accuracy and precision all the time in all aspects of what you do. So, what is the equivalent in our classrooms? The extra 2% is reading the directions, checking work, asking questions, erasing a wrong answer completely, filling in a bubble all the way, underlining and circling information in story problem. Wouldn’t it be great if that process was natural for our kids? Well… is it natural for us to go to the gym every day? Is it natural to train for a marathon? Is it natural to push our bodies to their physical limits? NO! We have to have the will to make a change from approximating or being “good enough” to doing our best. And our kids are the same way! It’s not enough to simply tell them to stop rushing or to check their work. Habits of Mind Animations has a great video on striving for accuracy for our elementary kiddos. It’s always better to use someone else (a character) to show why something is important, and the video featuring Marcus is definitely relatable to a lot of our kids. Fables with lazy characters work well because it’s very obvious to the kids what went wrong and how it could be avoided. For older kids, there are plenty of short cautionary tales or even snippets of movies and fine literature that can be used to lay a foundation for why striving for accuracy and precision is important. 2. Once you have laid a foundation and taught what “striving for accuracy” looks like in your classroom, reward it extrinsically. What this looks like varies by grade and classroom, but for me it’s making a big deal verbally and being super specific about the skill I’m seeing while giving a token (I LOVE using a token economy but that’s a post for another day). If I see a student erasing work, underlining parts of a math problem, or going back to look for information in a story, I make a huge deal in front of the other kids and yell out what they are doing… “Oh my gosh you guys! I can’t believe that Maria is working SO HARD! She is underlining important details and erasing all the way and going back and checking her work without me even TELLING HER!“ (I also have a system where the kids clap for each other while this is happening. I give tokens to random students who seem genuinely happy for each other because jealousy can definitely prevent kids from performing). Teaching a student or adult to strive for accuracy is no easy task. A support system that follows a student from school to home is the best bet. I’ve seen student behavior and work habits improve in as little as 2 days just from training a parent in how to positively and specifically praise their children. Kids WANT to make you happy… and at first, that is WHY they will strive for accuracy. Eventually, they will see that extra 2% effort pay off and will begin striving for accuracy out of intrinsic motivation… but until that point, it is up to the adults in their lives to create an atmosphere that encourages the habit we are seeking to instill.